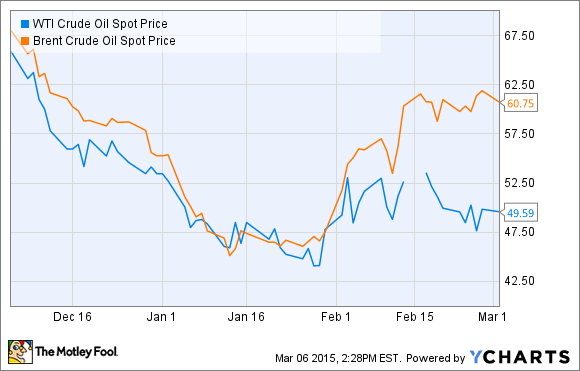 Oil inventories are at a record high, which could have a big impact on oil prices this year. If there's one thing that could cause a further plunge in oil prices just in time for summer driving season it's the growing U.S. oil glut. Oil inventories are as high as they've ever been, and it might not be long before the country literally runs out of a place for all of its petroleum. Worse yet, there are reasons to believe the supply glut will get much worse before it gets better. Depending on whether you're a consumer cheering for lower gas prices or an oil producer in a U.S. shale play, that could be either a very good or a very bad thing. Industry experts have been talking about the oil market being oversupplied by 1 million-2 million barrels per day since last summer. But that oversupply didn't really manifest into increasing U.S. inventories until 2015. That's when inventories started rising sharply, reaching a new record high last week. Source data: U.S. Energy Information Administration. Chart by author. Ironically, tankers operators such as Frontline (NYSE:FRO), Nordic American Tankers (NYSE:NAT), and Teekay Tankers (NYSE:TNK) are going to become a new source of inventory for the industry. Tankers are beginning to be used to store oil to perform arbitrage with oil prices, and that could expand in coming months. Frontline said in its fourth-quarter results that "the oil price drop is positive for tankers."